A tree once stood on a hill not far from the city. It was strong, big and beautiful. Its branches stretched upward toward heaven. The tree continued to grow lifting its branches wide for its Creator to see. This tree knew Who had created the world and all things great and small and he was a part of God’s beautiful world. 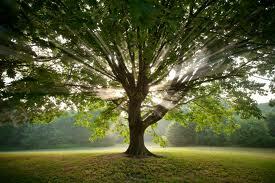 When the sun shone this strong beautiful tree would stand tall and sing with joy. When the rains came and the winds blew he would sway and clap his leaves giving thanks for living water. This was his calling. He knew this was why he was created. One day he heard much activity in his part of the forest. He heard men talking loudly, shouting to one another. What were these men shouting about? The next thing he heard was unthinkable. The men were cutting down the biggest, strongest and most beautiful trees with their axes. He was not prepared when the ax began to strike against his own trunk. Before he knew it, he fell to the ground with a great thud. In the darkness that covered the earth and in the quietness that followed, I heard the still small voice of my Creator saying, “This is my beloved Son in whom I am well pleased. He has obeyed me to die for the sins of mankind. You were chosen to hold my Son in His death, high in the air. You, who were strong and beautiful, were chosen to hold a beautiful Savior. The Redeemer. The King of kings and Lord of lords. You were created for this moment. Yes, you once stood tall in the forest. Yes, you were strong and beautiful, but you stand taller now and even more beautiful to Me because you now hold my Son. ~Written by my mother, Vivia S. Mattox. I love you, Mom. girl! this gave me continusous chills. it was so good! Thanks Jamie….I’ll be sure and tell my Mom next time I see her. She’ll be so happy to know God used it to speak to your heart. Hugs.